There’s nothing better than bite size pieces of chicken that are infused with Asian flavor. This simple Asian marinade comes together quick and easy. The chicken soak in the Asian marinade and then are grilled to perfection with fruit and vegetables. The first thing you want to do is to make the Asian marinade for the chicken at least two hours before you plan on grilling. I combine all of my ingredients in a mixing bowl and then pour it into a gallon size ziplock bag. This way I’m sure that all of the bite size pieces of chicken are soaking up the marinade, while they are in the refrigerator. While the marinade is working it’s flavorful magic you can enjoy your company and even grab a glass of Strawberry Punch. 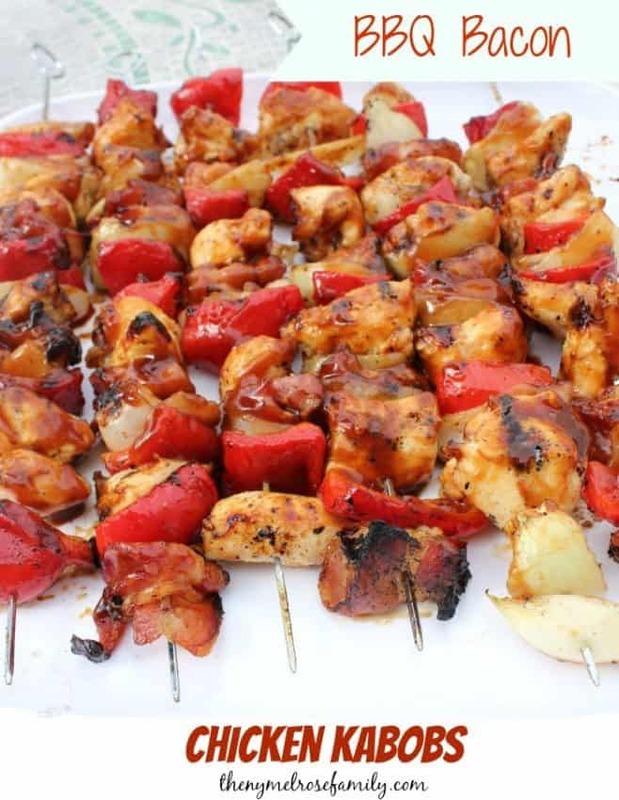 Once you are just about ready to grill, cut up the fresh vegetables and fruit for the skewers. We like to use red bell peppers, onions and pineapple, but feel free to change the vegetables to your favorite or whatever you were able to find at the local farmer’s market. One tip to keep in mind is that if you are using bamboo skewers, you want to soak them in water for about 30 minutes before you use them. This way they don’t catch on fire on the grill. 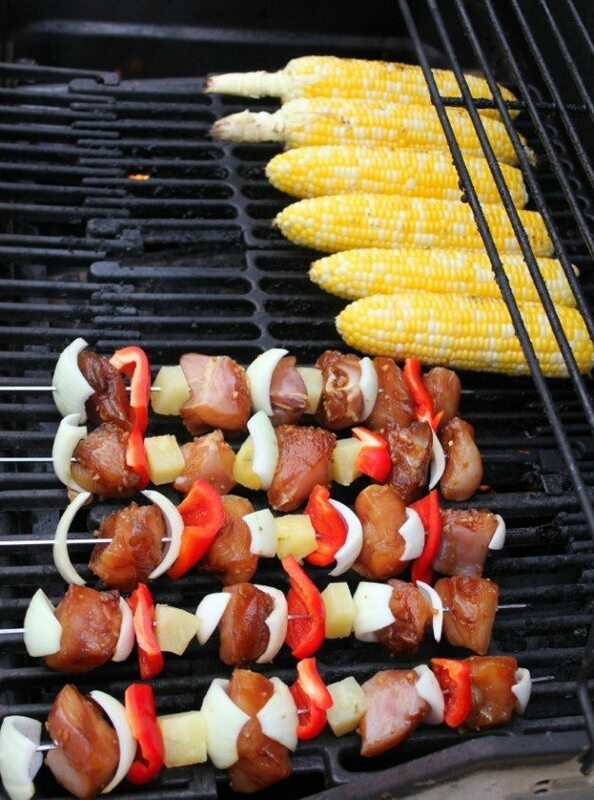 We use our metal skewers for our Asian Chicken Kabobs and save the bamboo skewers for our Lime Tequila Shrimp Kabobs. There’s just something about shrimp and bamboo skewers that seem to go together. 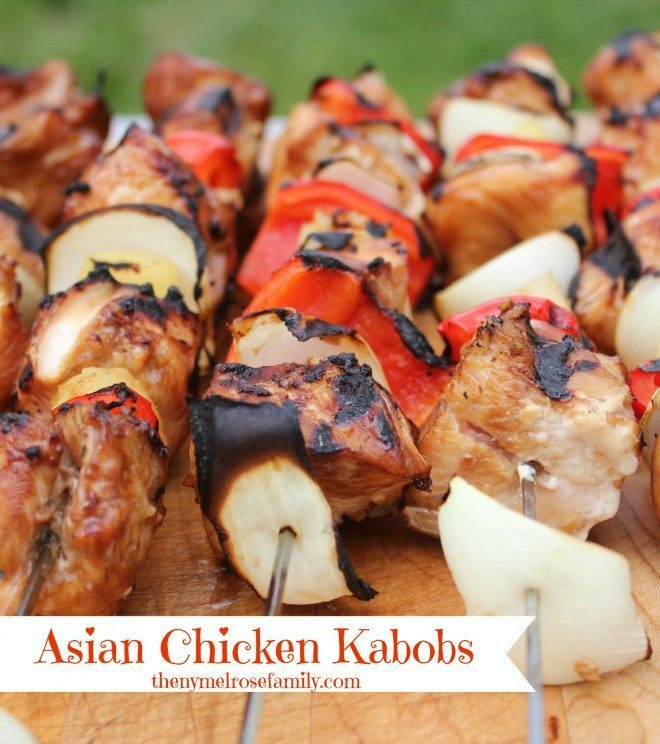 A flavorful Asian marinade makes these Asian Chicken Kabobs a perfect entree for any barbecue. In a small bowl combine the soy sauce, teriyaki sauce, sesame oil, honey, grated ginger root and cloves of garlic. Pour the marinade into a gallon size ziplock bag and add the bite size chicken pieces to the marinade. Seal the bag and refrigerate for at least two hours before grilling. Just before grilling alternate the chicken, pineapple, red bell peppers and onions on skewers. 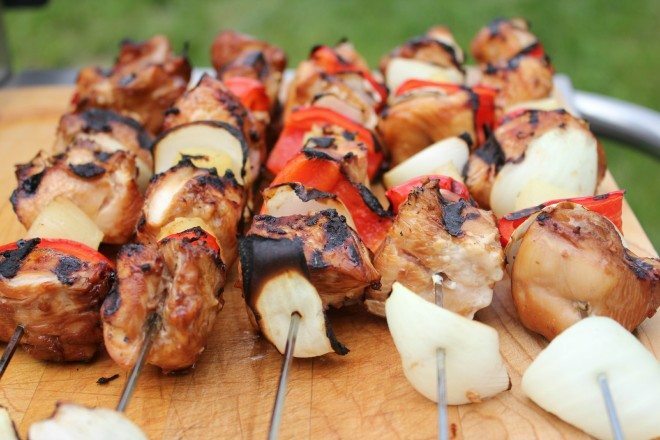 Cook the skewers on the grill for about 8-10 minutes depending upon the size of your chicken. If you’re looking for more ideas for grilling, be sure to check out my Cookout Ideas for inspiration. I need to be at your house for dinner! These look so good Jenny! Those look incredible, Jenny. I LOVE chicken kabobs and don’t make them often enough. This sounds wonderful! I love adding fruit to kebobs and this asian version sounds fantastic. Love cooking corn on the grill…great photo’s too! So getting hungry for a great grilled feast now! MMMMmmmmm! Jenny, those sound SO good …. I’m putting them on this week’s menu list. Awesome flavor combo, Jenny!! There wouldn’t be any leftovers in my house! Mmm – I love asian flavors with chicken – yummy! This looks great! I’m going to use GF soy sauce and teriyaki sauce for my family. They will love it. We would love you to share this or any of your amazing posts at our weekly Super Saturday Link Party. It starts Friday’s at 6pm, hope we see you there! i really like all the recipies info, its really great… keep it up!